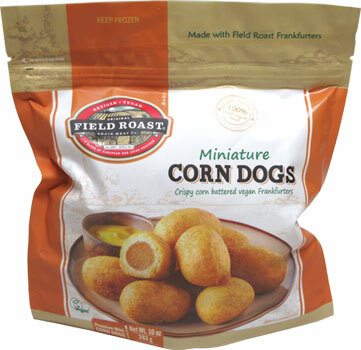 Field Roast Miniature Corn Dogs harken back to county fairs, amusement parks and summertime fun! Field Roast starts with their delicious vegan Frankfurters, dunks them in traditional sweet cornbread batter, then crisps them to perfection. Top off with ketchup or mustard and you've got the classic American treat ready in 20 minutes in the oven, or, just 90 seconds in the microwave if you're in a hurry! 10 oz. (283g) package contains around 12 Mini Corn Dogs. $7.99 per package. From brenda king of augusta, Georgia on 3/1/2019 . I'm not a fan of most Field Roast items but I bought this based on the reviews and I'm glad I did. This will be a regular item on my shopping list. I will admit that I had the munchies and had a few cocktails before eating this but I'm sure it will be just as good sober. From Lisa Salyers of Columbus, Ohio on 6/21/2018 . These are the best vegan hot dogs I've tried so far! (I'm still a babyvegan so I haven't tried many yet.) The flavor is pretty on point, especially with that coating. The texture is slightly more dense than a meatbased hot dog, but that doesn't bother me in the slightest! In fact, it kinda has the same texture as an all beef hotdog instead of the regular chicken/pork/beef mixture most hotdogs are made of. Dipped these in some vegan honey mustard and it was delish! I hope they make full-sized versions of these at some point. From Angela Whitlock of Manhattan, Kansas on 5/13/2018 . The only thing I didn't like about my order was that the box was warm when it arrived. The ice packs were no longer frozen or cold. I put the package in the freezer immediately. However, they taste great! I may have to order these again. Field roast is doing great things! I used to LOVE corn dogs before I became vegan and am glad to be able to try them again! From Leslie Smith of grand blanc, Michigan on 3/29/2018 . These are perfect! Nice and hot doggy on the inside, crispy and sweet on the outside. From Kara of Green Bay, Wisconsin on 1/28/2018 . These are so good. I could have eaten the entire package but I am glad I did not so that I can have some later.